I was at a Japanese book store and the store clerk was helping me look for the book for a while. I felt bad and told her けっこう, as in she didn't have to help me anymore so she can get back to what she was doing. After I left I felt the word I used was too abrupt and rude. What word or expression should I use to tell someone nicely it's ok or you don't have to help me anymore? This is a very good question. However, I also think it's not an easy one that beginners can understand easily. I will try to give you my best answer. 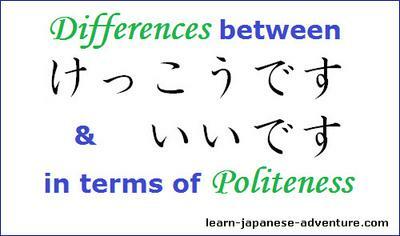 Both けっこう (kekkou - na-adj) and いい (ii - i-adj) have multiple meanings. Depending on the situations, they can have different meanings. However, in the situation described in your question, both of them have the same meaning of - enough, no need, unnecessary. Actually in your situation, I would say both of them are ok to use. It all depends on the way you say it. けっこうです (kekkou desu) or いいです (ii desu) would let the store clerk know that it's ok that she doesn't have to help you anymore. But if you really want to differentiate the politeness of けっこう (kekkou) and いい (ii), I would say けっこう (kekkou) is more polite. Meaning: It's ok. Thank you very much for your help. While saying the above expression, smile to the store clerk and slightly nod you head to show your appreciation for her help. I think the store clerk will definitely feel your politeness and gladly go back to what she was doing before serving you.